Coffee’s effects on the brain are actually quite profound. The science behind caffeine’s pick-me-up power comes from its ability to trick the brain into thinking it's another molecule called adenosine, which tells the brain when it’s time to sleep. In doing so, it potentiates the release of dopamine and adrenaline, among other stimulants, which keep a person awake, attentive, and in a better mood. However, that’s after, say, one to two cups, depending on how much caffeine they hold. People who consume more than that may begin to experience too much of caffeine’s stimulant effect. A report in the journal Advances in Psychiatric Treatment notes that symptoms of excessive caffeine ingestion and psychiatric disorders often overlap because they “may both have a basis in overactivity of the sympathetic nervous system.” In fact, people who regularly consume more than 1,000 milligrams, which is somehow possible, show symptoms virtually “indistinguishable” from anxiety disorder. It goes on to say that people who are likely to experience panic attacks or social phobias are naturally more sensitive to caffeine’s effects and are therefore more prone to have these conditions exacerbated. 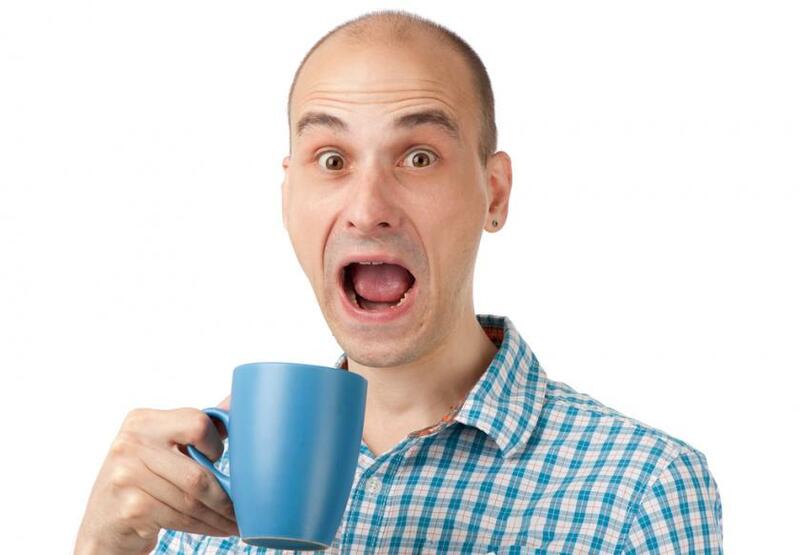 In turn, the coffee drinker becomes erratic, nervous, and irritable. Sometimes, these effects may go so far that they can be compared to symptoms of psychosis. In the same psychiatric report, the authors mention that schizophrenics tend to drink more caffeinated drinks, though the “literature is inconsistent.” They hypothesize that they could do so to relieve boredom and apathy, or simply to offset the sedating side effect of antipsychotic meds. Hallucinations and delusions are common symptoms of schizophrenia and cause a person with the condition to experience everything from a strong belief in conspiracies to falsities in what the sense picks up. Oftentimes, they hear things that aren’t there. Caffeine is, after all, a psychoactive drug. The Mayo Clinic suggests anyone who drinks about 500 milligrams of caffeine a day, or five cups, cut back. It’s probably a good idea. A study from La Trobe University in Melbourne, Australia, found five cups was exactly the amount that made people hear the song “White Christmas” by Bing Crosby, even though they were actually listening to plain white noise. In the same way that caffeine stimulates the brain, the stimulant effects translate through the central nervous system (CNS) into the muscles and heart, affecting motor activity as well. It’s not unheard of for a person who’s had even 50 milligrams of caffeine to experience an increased heart rate, or tachycardia, and agitation, according to a study published in The Medical Journal of Australia. The CNS’s overactivity is to blame for this, and in just the same way that it causes the heart to overreact, it can act like an electric shock to the rest of the body, too. In turn, the overcaffeinated person experiences muscle spasms and restlessness. According to the National Institutes of Health, caffeine is among the top three causes of eye twitches. These twitches are characterized by repeated and uncontrollable spasms of the upper eyelid, a sensitivity to light, and blurry vision. But these effects can be felt anywhere in the body. From tired leg muscles, which may be especially prone to spasms after a workout, to your throat and voice box. Spasms in the latter two areas can cause people to stutter and have difficulty with speech, as they not only struggle to control how their words come out, but also have difficulty focusing on their speech patterns. The bone disease that affects one in two women and one in four men in the U.S. is caused, in part, by a deficiency of calcium in a person’s body. As the bone deteriorates, microscopic pores on its surface get bigger, thus making it more fragile. Some scientists suspect that the condition may develop as a result of too much caffeine. Although the findings from multiple studies have been inconclusive, they’re based on the idea that coffee can hinder the digestive tract’s ability to absorb calcium, says Dr. Robert H. Shmerling, of Harvard Medical School, in an MSN Health article. One study, published in the Journal of Bone and Mineral Research, that looked at caffeine’s effect on bone, found that caffeine had no significant effect on five of six skeletal sites. However, the one site that was affected by caffeine was the femoral shaft — the bone extending from the hip to the knee, which is also supposed to be the strongest in the body. These findings were only associated with older women, while caffeine actually showed improvements in bone mineral density among younger women. Meanwhile, another study found that elderly postmenopausal women who both drank over 300 milligrams of coffee and had a specific genetic variant of vitamin D receptor experienced loss of bone mineral density in their spines — vitamin D deficiencies are also linked to osteoporosis. Mayo Clinic advises everyone to drink, at most, 400 milligrams of caffeine per day, or an average of four cups. But with varying levels of caffeine in each cup of coffee, it might be best to just stick to one or two. If you’re really just looking for more energy, however, here are some other ways to do it without caffeine.